In stark contrast to the lucrative partnership that Zynga and Facebook have enjoyed, the two digital giants had been discussing parting ways. In 2011, Facebook was receiving 12% of its revenue from in-app purchases through such blockbuster social apps as Words With Friends, Farmville and Cityville. Citing dissatisfaction with the Facebook payout structure, Zynga began exploring options towards creating their own platform and gaming community without the assist from Mark Zuckerburg’s Facebook. Advertising revenue splits have always been a bone of contention and by having the games running on their own platform, Zynga would be able to keep their ad revenue and launch new games directly to people who were eager to play them, without the normal login hangups and policies that Facebook employs. By working through their differences and reaching common ground, both companies have successfully had their initial public offering on Wall Street, have a major reserve of capital for new acquisitions, research and development and are breaking into new markets on a monthly basis. 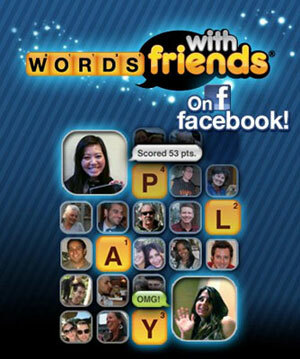 Do you play Words With Friends on Facebook? Only of Facebook or on another device or website too? How often do you play Words With Friends? On average, how many games do you have running simultaneously? Would you consider yourself a casual fan of the game or a more aggressive player? The zynga store pops up instead. WHY CAN’T I GET ON WORDS WITH FRIENDS? NO MATTER WHAT I DO, ZYNGA STORE SHOWS UP. I played Words With Friends for about 6 months now via Facebook running on Google Chrome. About 2 weeks ago I loaded the game, again through facebook. but while everything on the page but the letter tiles. There were none on the active game board or on the tile rack. I have 4 active games going and none of them will load. I’ve done all of my Windows 7 updates, cleared cookies, rebooted the computer, even went to the trouble of unloading Chrome and downloaded and installed the newest version of Chrome. The game simply doesn’t work. Can you offer any suggestions or solutions? I really enjoying playing, I am disabled and in a wheel chair, so Facebook specifically and Words with Friends keeps me entertained and interacting with friends and family. Thank you for reading this and I really hope you have a fix for me.